The Vienna Range is a stunning collection of wooden furniture that will add a touch of understated elegance to your home. 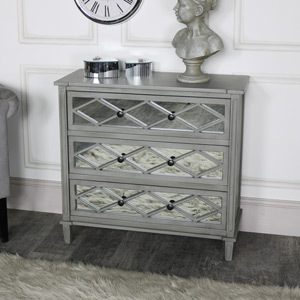 The Vienna Range has wooden latticed detailing over a mirrored inlay on it’s frontage, a soft grey stained finish and rounded brass style handles. The ranges simple, stylish design and fabulous trending colour lends it the ability to fit into vintage or contemporary style interiors and a variety of decor themes. 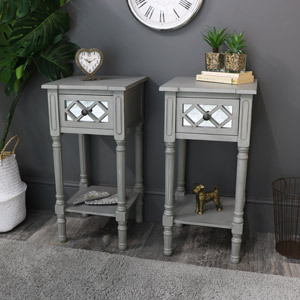 There are several items included in this range, such as two different sized console tables, a chest of drawers, a cupboard and bedside tables available in two different designs. The Vienna range would look amazing in a living room, hallway or bedroom and is ideal for lovers of mirrored furniture who don’t want the mirrored detailing to overpower a room. 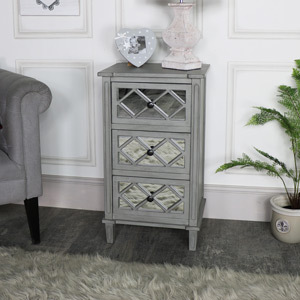 If you have been looking for some gorgeous storage with a classic look that will never go out of style, or just love grey interiors, the Vienna Range is for you!